Winter Wonderland in Minnesota's Otter Tail County. From the edge of Lake of the Woods to the Headwaters of the Mississippi, from the hardwood forests of Maplewood State Park to the jail trail of St. Cloud, northwestern Minnesota offers the widest variety of cross country ski trails in the state.There are many winter ski resorts and lodging outlets with ski packages that include meals and a hot sauna. 10.1km 218-927-7364 (P) Beginner to advanced, groomed classic and skate trails through rustic forest. MN ski pass required. 6.4km 320-762-2966 (P, B) 97 acre park with gentle wooded hills through tamarack. MN ski pass required. 11km 218-864-0110 (WH, P, B) Beginner to intermediate, classic trails on rolling hills over prairie and northern hardwoods that pass several lakes. Weekend shelter with fireplace, historic lodge rental, camper cabins. Ski and snowshoe rentals. MN ski pass required. 5.6km 218-783-6252 (P, B) Unique rock outcrop near Rainy River. Secluded and peaceful. 25km 218-243-2231 (WH, P, B) Intermediate to advanced loops through woods. Family resort since 1949 with downhill skiing, snowboarding, tubing, sleigh rides, replica logging village, large lodge, kitchen and shops. Home of the Minnesota Finlandia and Snowjourn races. Also downhill skiing. MN ski pass required. 7km 218-759-0164 (P, B) Beginner, groomed for classic. Red and white pine and tamarack bog along Lake Lyra. MN ski pass required. 7km 218-759-0164 (P) Easy beginner trail, groomed classic and skate. MN ski pass required. 17.6km 218-318-2300 (WH, P, B) Beginner to advanced, four loops, groomed double classic near Lake Bemidji. Warming shelter during office hours, annual candlelight ski. 28 miles of skate ski within 5 miles of park. MN ski pass required. 4.5km 218-759-0164 (WH, P, B) Beginner, gentle course in the city of Bemidji with 2km of lighted trail. Close to hotels and restaurants. MN ski pass required. 14km 218-759-0164 (P, B) Intermediate to advanced, classic and skate. Steep and rolling hills through black spruce bog, red pines and hardwoods. Used by local racers to train. MN ski pass required. 28km 218-759-0164 (P, B) Beginner to intermediate, groomed classic and skate with beautiful views of Three Island Lake and Turtle River. MN ski pass required. 3.5km 218-759-0164 (P, B) Intermediate to advanced, groomed classic ski trail. MN ski pass required. 9.6km 218-825-3075 (WH, P, B) Beginner to intermediate trails through woods along Mississippi River with town of Crow Wing historic site and historic Red River Oxcart Trail. Not groomed. 16km 218-825-0410 (P) Expert only. Well-groomed and challenging trails in glaciated area with great views of Mississippi River Valley. MN ski pass required. 20km 218-825-0410 (WH, P, B) Beginner to intermediate, classic and skate ski with nearly 5 km lighted trail. MN ski pass required. 40km 218-825-0410 (WH, P, B) Mostly beginner to intermediate with some advanced loops. Varied terrain through pine and hardwood forest around several scenic lakes. Trail links Kavanaugh's and Cragun's resorts. Ski rentals at Cragun's. MN ski pass required. 64km 218-375-4466 (WH, P, B) All levels, many well groomed loops through maple forest with rolling hills. Mostly classic with some skate ski. Privately owned cross-country ski resort with lessons and rentals. Sauna and hot tub. 9.5km 320-852-7200 (WH, P, B) Intermediate, groomed classic only, rolling terrain through tamarack bog, marshes, woodland ponds and lakes. MN ski pass required. 13km 218-546-8131 (P) Beginner to advanced, groomed classic with challenging hills through hardwood forest and mature pine. Shelter along trail, maps at intersections. 11km 218-218-692-2688 (P) All skill levels. Groomed trails through a mixture of scattered old pines with lots of young conifer plantings and young aspen. 15km 218-546-8131 Beginner, skate and classic, with some advanced loops, rolling hills, wooded area with oak trees, red and white pines, wetlands and tamarack bogs in the Lansin R. Hamilton Memorial Forest. Passes by Larson and Dogfish Lakes. 7km 218-844-SNOW (P,B WH) Ski trails ranging from skate and classic to classic only. Beginner to advanced. No MN Ski Pass currently required. See website for details. 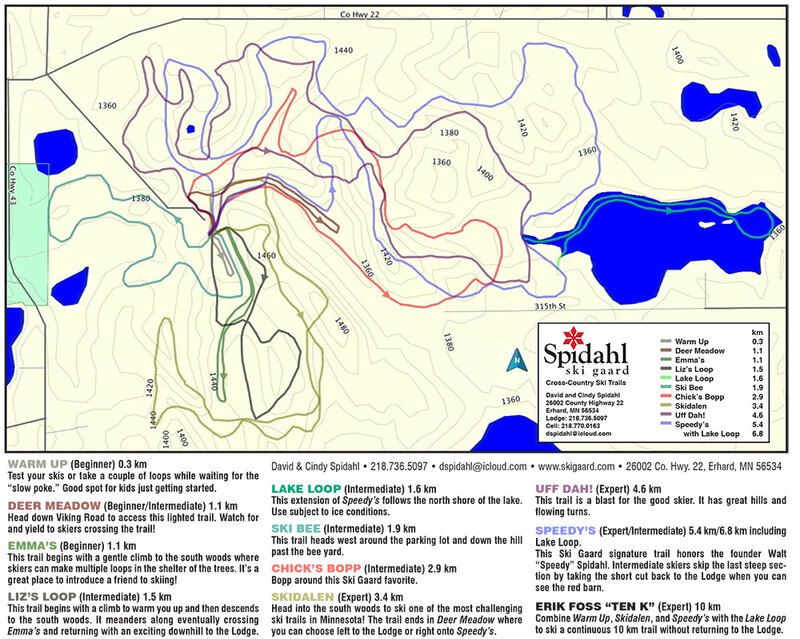 6.1km 218-847-9202 (P, B) Beginner with some hills, west of Detroit Lakes, groomed classic all levels. 16km 218-847-9202 (P) Mostly beginner with loops for all levels, groomed single-track through pines, lakeshore, forest and meadows. 5k 218-847-9202 (P) All levels, both classic and skate skiing on wide, regularly groomed trails through hardwood forest. 9km 218-847-9202 (P) Narrow single track trails through hardwood forests. Groomed occasionally. 12km 218-847-9202 (P, B) Beginner to intermediate, generally even terrain with a few short hills. Occasionally groomed, plus 20 miles of ungroomed trails. Located in the Tamarac National Wildlife Refuge. MN ski pass required. 24km 218-736-5097 (WH, P, B) All levels. Groomed classic and skate through 340 acres of hardwoods and prairie near Maplewood State Park. Privately owned. Fee applies. Ski and snowshoe rentals. 9.6km 218-498-2124 (WH, P, B) Beginner trails, through remnant prairie and hardwood forest. Not groomed. 18km 218-947-3338 (WH,P, B) Beginner to advance through rolling hills. 6km groomed for skate ski. Located in the Deep Portage Conservation Reserve. Interpretive Center open all week. MN ski pass required. 8km 218-947-3338 (P) Beginner to advanced, inside Foot Hills State Forest. MN ski pass required. 15km 320-965-2455 (WH, P, B) All levels of classic and skate through forest and around lakes. Adjacent to downhill ski area with 1.5km lit trail. Ski rentals available. 11.2km 218-754-2200 (WH, P, B) Beginner trails with no hills along Lake Bronson. Heated shelter with restrooms. Snowshoe rentals available. Not groomed. 5.6km 320-616-4959 (P, B) Beginner trail, groomed with two parallel tracks, with gentle hills. Trail follows Platte River, skirts around several wetlands, winds through mixed hardwoods, crosses fields restored with prairie grasses. Waterfowl observation deck along trail overlooking Skunk Lake. 5km 320-616-4959 (P, B) Beginner to intermediate. Not groomed, but user tracked. No ski pass required. 16km 218-947-3338 (P, B) Beginner to intermediate trails through woods, over gently rolling hills and around wetlands. MN ski pass required. 8km 320-983-5729 (P) City of Milaca trails are groomed single track. 20 km 800-432-3788 (WH, P, B) All levels over three loops, well groomed for classic and skate through 360 acres of pines, prairie and wetland. Lodging available with pool, hot tub and spa. Rentals and changing rooms on site. 32km 320-532-3523 (WH, P, B) Beginner to advanced, several loops through wooded terrain. 11km 218-947-3338 (P) Beginner to advanced trail in the Land O'Lakes State Forest with a trail shelter. 7.2km 800-450-5522 (P) Beginner to intermediate, groomed classic ski trails through rustic forest. MN ski pass required. 45km 218-699-7251 (WH, P, B) Beginner to advanced, groomed with many loops. Ski to the headwaters of the Mississippi River amongst towering white pines on easy rolling hills. Visitor center with fireplace is open year round. Mississippi Headwaters Hostel is inside the park. MN ski pass required. 10km 218-732-4111 (WH, P, B) Beginner to advanced trails that wind through a varied forest ranging from baby aspen to mature balsam and pine with rolling hills. Skate and classic. MN ski pass required. 20km 218-863-8383 (WH, P, B) Intermediate to advanced, four loops of classic ski through hardwood forest, over hills and around many lakes. Annual candlelight ski. MN ski pass required. 16km 218-947-3338 (P, B) Beginner to advanced skiing. 6km 320-255-6172 (P, B) All beginner trails, groomed for classic skiing right along the Mississippi River. 9.6km 218-425-7504 (P, B) Groomed beginner trails along Hayes Lake and North Fork Roseau River. Snowshoe rentals available. MN ski pass required. 6km 320-255-6172 (P, B) Beginner to intermediate, groomed classic through woods with some challenging hills. 41-acre site surrounding Warner Lake. 5km 320-650-3053 (WH, P, B) Beginner to intermediate trails with flat to rolling hills along the Mississippi River near downtown St. Cloud. 6km 320-255-6172 (P, B) Beginner to advanced. Six classic ski loops that wind through a wooded setting. MN ski pass required. 2.25km 320-352-5201(P) Groomed classic and skate ski trails next to the Sauk River. Rated easy to moderate with cut-offs to avoid the few large hills. 1.5km 218-686-9785 (P) Beginner classic ski trails that wind through a wooded setting along the Red Lake River. 12km 218-686-9785 (P) Beginner to intermediate classic trail. Ski on the frozen Thief River from Red Robe Park to the golf course. Monthly moonlight ski event. 9km 218-632-7704 (P) Beginner to advanced, classic ski trails that wind through a wooded setting. 6.3km 320-255-6172 (P, B) Beginner to intermediate with a skating loop and classic loops. Ski past granite quarries and rock piles on lighted trails. 323 acre State Scientific and Natural Area within park with additional 5km of ungroomed rustic trail shared by snowshoers and skiers. Quarry Park parking pass required. 23km 218-947-3338 (P, B ) Beginner to expert trails on the slopes of the Shingobee River Valley. Groomed for classic and skate skiing. MN Ski Pass required. 23km 218-734-2241 (P, B) Beginner to intermediate trails on Little Bemiji Lake, groomed for classic and skate skiing. Day passes and ski rentals available. 17.6km 218-783-6252 (P, B) 14k trail ranging from beginner to intermediate near Lake of the Woods. Catch glimpses of timber wolves and deer. Not groomed.